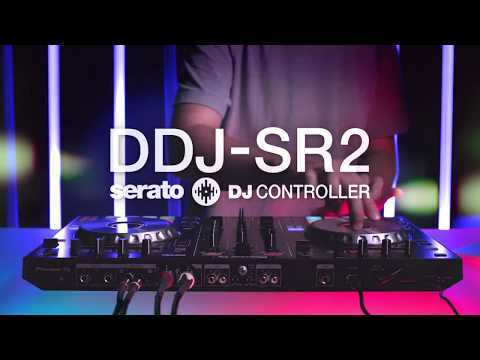 Building on the success of the original DDJ-SR the Pioneer DDJ-SR2 DJ Controller adds even more features whilst reducing the weight by 18 percent making this one of the most compact Serato DJ controllers available. Featuring highly responsive aluminium finish jog wheels, multicoloured performance pads and a dedicated mixer feature to control music stored on your PC/Mac via Serato DJ, the DDJ-SR2 is a great example of why Pioneer are so popular amongst DJ's. The Pioneer DDJ-SR2 inherits design traits directly from Pioneer's top of the line controllers so you get a truly professional workflow. Everything from the high-quality aluminium-finish top panel and jog wheels, multi-coloured performance pads and dedicated mixer controls ooze premium quality construct. A great new feature on the DDJ-SR2 is the inclusion of a needle search pad which opens up the capability to instantly jump to any point in a track simply by touching the pad. This makes for quicker cueing mixing capability. The pads on the DDJ-SR2 have also been upgraded with multi-colour functionality to show the different pad mode and playing status. Whilst the DDJ-SR2 remains compact and lightweight, serious consideration has been given to the spacing between faders, buttons and knobs for comfortable, intuitive mixing and scratching. Bundled with the Pioneer DDJ-SR2 is Serato DJ including the new Pitch ‘n Time DJ expansion pack which opens up the ability to shift and sync the key of your tracks as well as increase and decrease BPM to extreme tempos while retaining the original key of the music. With this you will be able to achieve perfect, same-key mixes with absolutely any combination of tracks. Should you also wish to purchase the Serato DVS upgrade sometime in the future, the DDJ-SR2 is 100% DVS ready. Finally, Pioneer have given the DDJ-SR2 a professional XLR master output, a TRS booth output and secondary master output so you will be able to connect to any club PA system or home sound system with ease.